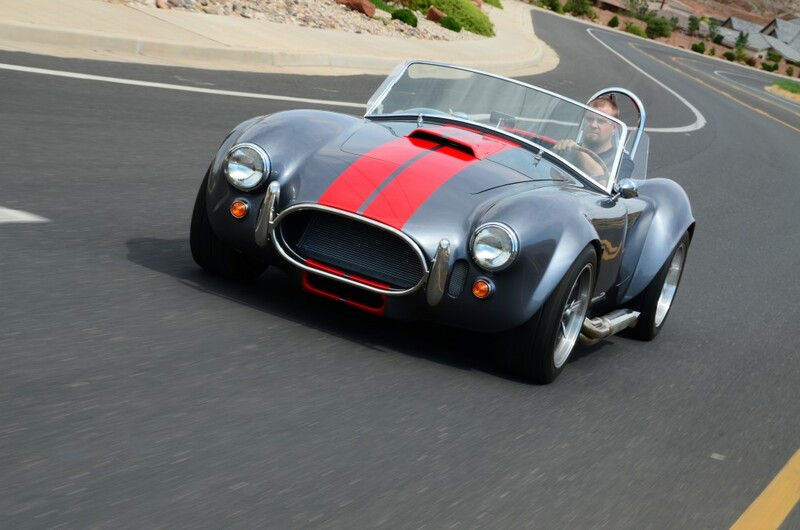 When Summit Racing chose to a build a Sixties-style Cobra roadster, focusing solely on the past was not an option. This project not only captures the sound and fury of a classic muscle car, but also benefits from decades of development in automotive technology. 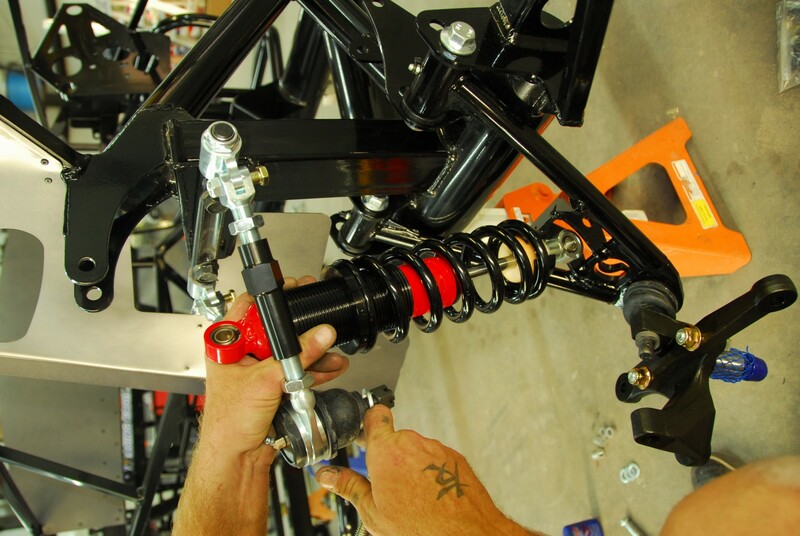 Everything on the chassis, from the frame rails to the custom suspension to the Ford 427 stroker V8–all of these components are engineered for improved performance and long-term durability. 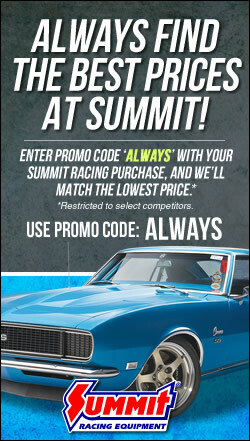 They’re also readily available from Summit Racing and Factory Five Racing (FFR) for ease of construction. In this series of articles, we’ll be providing hands-on tech tips that show how simple and affordable it can be to build your very own modernized classic, a performer that features both the style of an original and the technology of the latest street machines. Stay tuned for upcoming installments, because once we’re all done, you’re in for one wild ride in Summit Racing’s Cobra roadster. Starting with the foundation, one quick look at the Factory Five Racing’s Mk4 frame tells you this ain’t your old man’s Cobra. FFR’s four-inch round-tube main rails have thicker walls (0.120 versus 0.095 inches) than the original, and a backbone section and extra perimeter tubing doubles its torsional rigidity. The dash/cowl hoop is welded to this structurally stronger frame via a cockpit surround cage, as are the hinges for the hood, doors and trunk. Safety enhancements include a taller, stronger rollbar, along with triangulated bracing, side-impact bars and crumple zones. Add to that CNC-cut aluminum panels for lining the cockpit, trunk, and engine bay. These panels, made of 6061-T6 aluminum, are stiffer than traditional 4000-series aluminum, and backed by an integrated maxtrix of steel tubing for bracing and support. 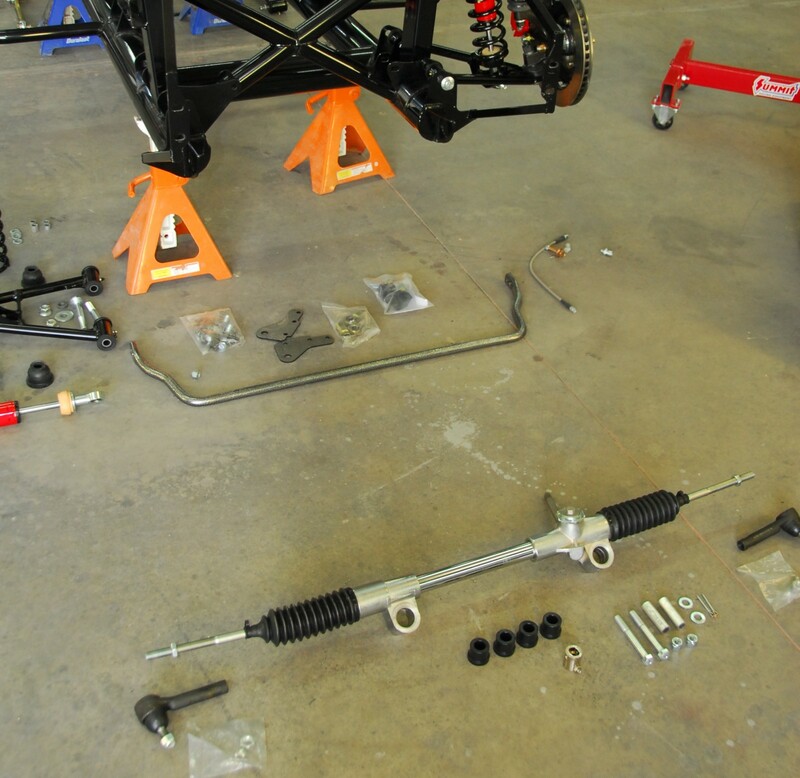 For Part 1, in the accompanying photos and captions below, we’ll focus on installing the front suspension and steering rack, and then move to the rear-end in part two. Final chassis tuning and scaling will be covered at the end of this series, after we show details on the engine assembly and drivetrain install, along with body prep and finish details. Then we’ll head out for some driving fun! And don’t forget–you can find an overview of all the parts used on the project in the Mk4 Anatomy, Part 1 and Mk4 Anatomy, Part 2 posts. 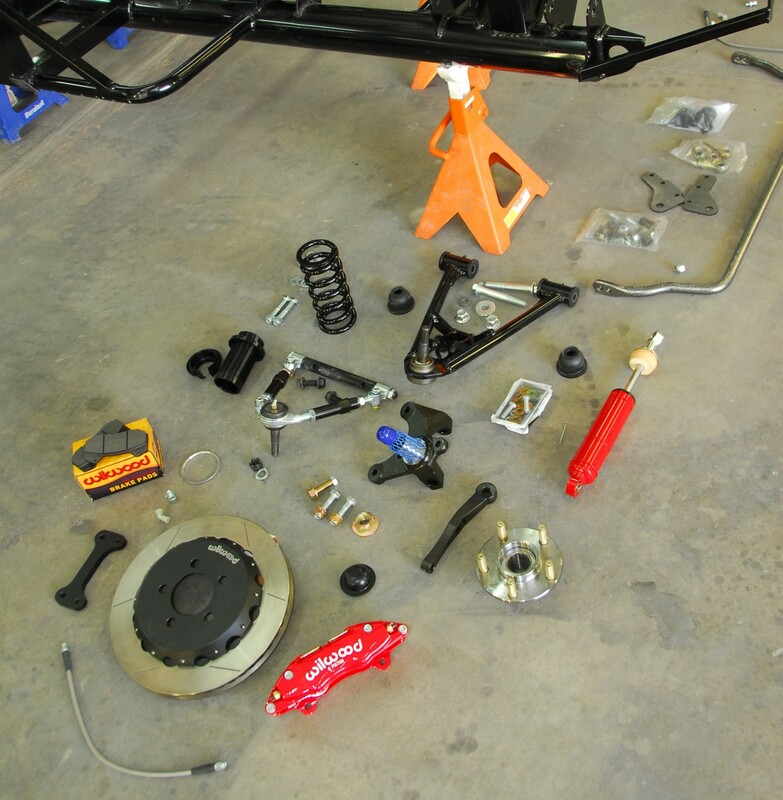 Here’s the overall layout of the all the parts that are going into the Summit Racing Cobra replica, built by SKJ Customs in St. George, UT. The cost of the FFR Mk4 complete kit is $20,000 (not including drivetrain, paint, and some optional upgrades). Since every construction project needs a good foundation, we’ll focus first on the details of the frame, and how the suspension bolts up. Then we’ll move onto the engine assembly, body prep, and final finish work. 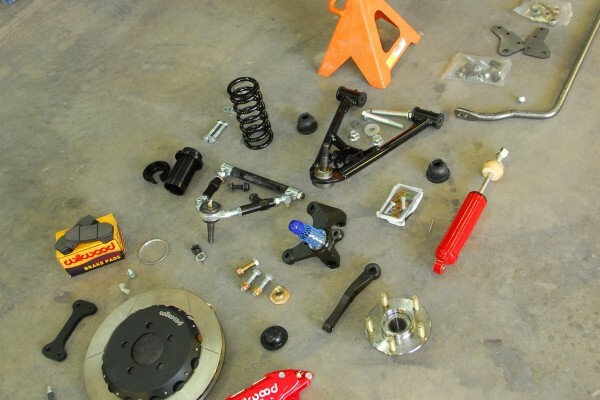 This closeup shows all the components that come with the Mk4 complete kit, such as custom tubular control arms, Koni coil-over shocks, and optional Wilwood brakes with 13-inch rotors and six-piston calipers. 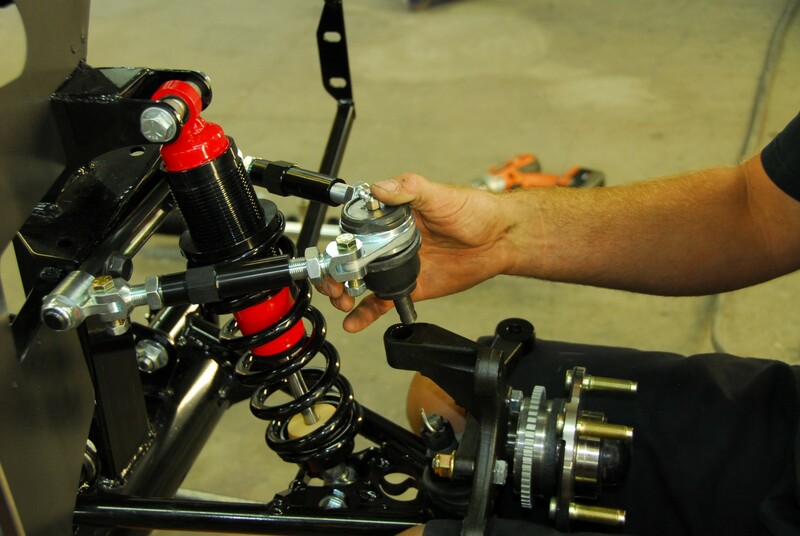 The independent front suspension features upper and lower A-arms with unequal-lengths in order to maintain camber control. While Ford Mustang factory units can be used, the optional tubular-steel arms shown here are two to three pounds lighter than stock, for reduced unsprung weight. 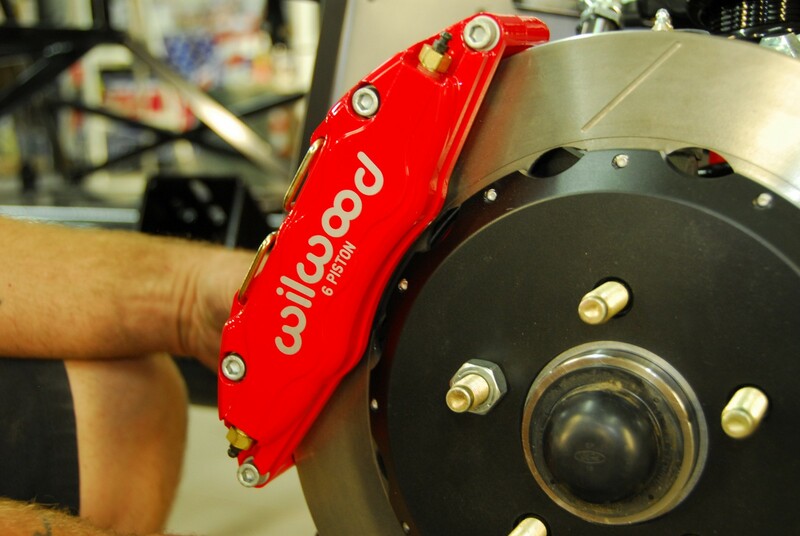 They also use polyurethane instead of rubber bushings for less flex and more consistent suspension geometry. 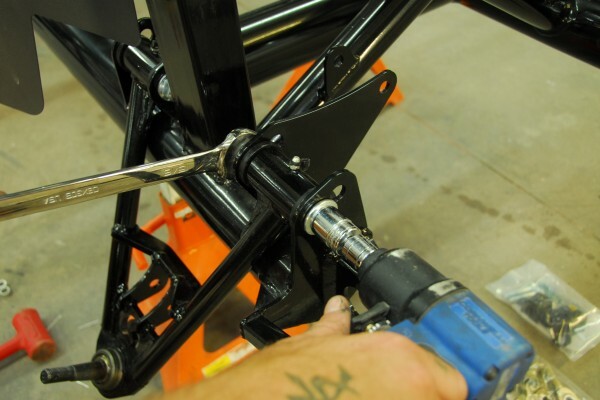 The arms simply bolt into the mounting brackets, with no welding or fabrication required. 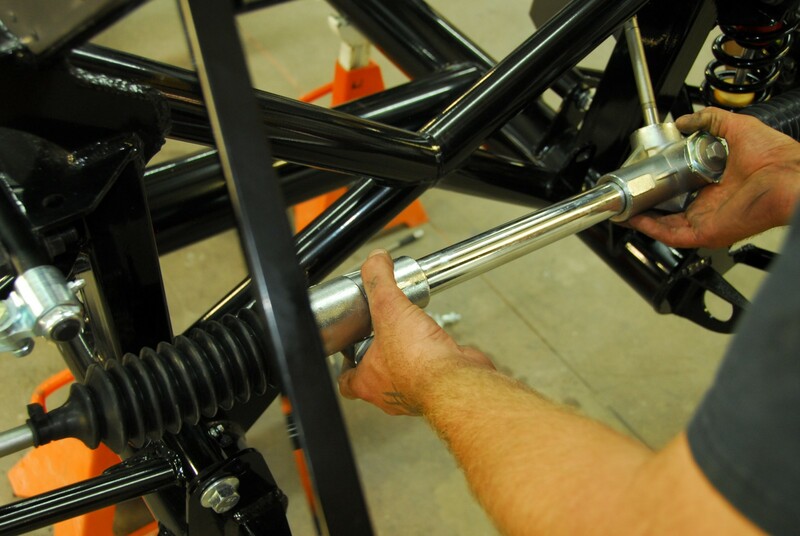 A pair of Grade 5, 5/8-inch bolts secures the adjustable upper A-arm to the suspension upright. It’s securely supported by an original-stye round-tube X-member at the front of the frame. 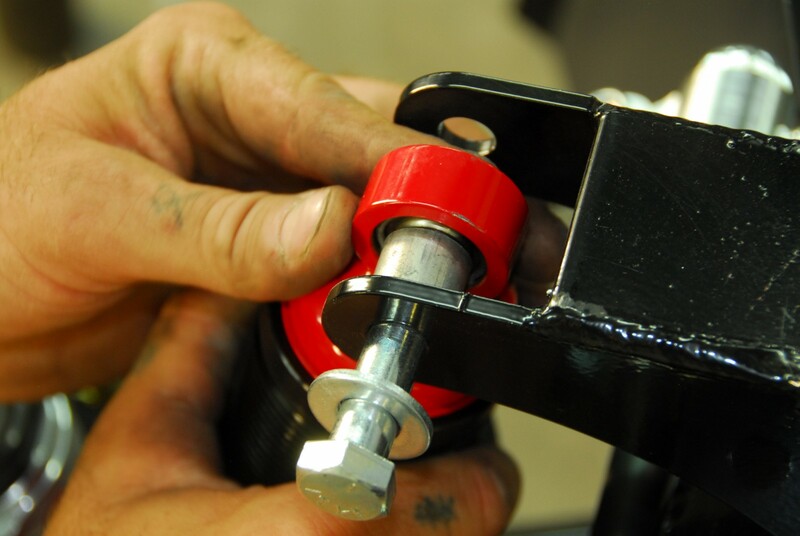 Note the adjustability of the A-arms for fine-tuning the suspension geometry, both caster and camber, along with grease fittings for thorough lubrication. A fairly wide range of settings is needed to tailor the feel and effort for either power or manual steering. 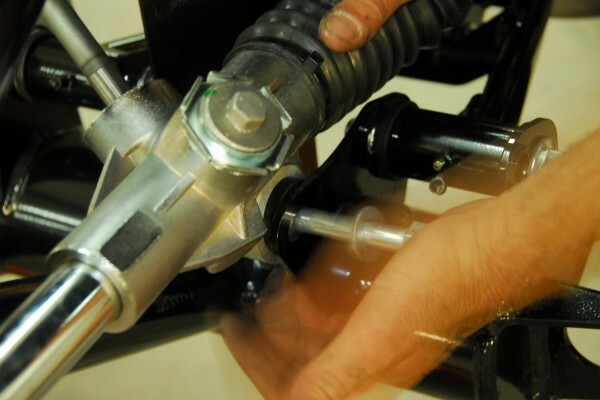 With the ball joint located farther forward these units offer two to three degrees more caster than stock arms. The coil-overs include Koni’s premium-grade, monotube shocks that have a larger volume of oil to keeps the temperature lower. With an internal rebound adjustment, they also offer more control for fine-tuning the chassis. And the coils can be adjusted for the desired ride height as well. This closeup of the top of the coil-over shows how it bolts into the upper brackets with aluminum spacers to keep the shock centered. Once the coil-over is bolted in place, the custom-forged spindle can be attached. It includes an ABS ring should a builder want to add that brake upgrade. 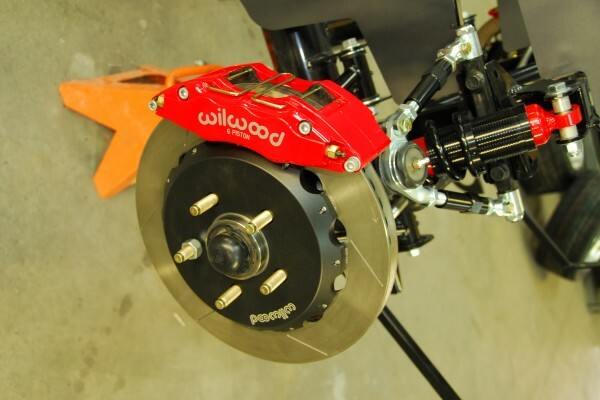 The standard package includes 1999-2004 Ford GT brakes with 11-inch rotors, twin-piston calipers, and stainless steel brake lines, fittings, and fasteners Wilwood’s 13-inch slotted and vented rotors with six-piston calipers are an available upgrade. This setup is to ensure even pad wear, better feel and longevity in high-performance applications. The pads are high-performance units for street use. The steering system is an aftermarket manual performance rack for Fox-body Mustangs, designed to handle a much heavier chassis. The ratio is quicker, three versus four turns, and the rack is designed to custom minimize bump steer. And the sway bar is the same one used for the FFR Challenge Series, race-tested and adjustable, made of 7/8-inch spring steel with poly bushings. 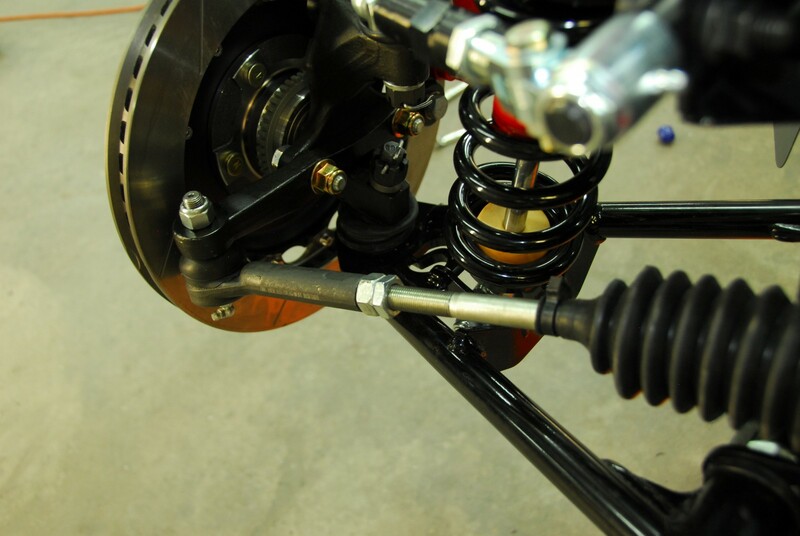 Seen from above, the steering rack is custom-made for the FFR frame, and slips in between the suspension fronts. After some gentle persuasion with a plastic mallet, the bolts secure the steering rack into the frame mounts. Here’s how the rack looks after being attached to the spindle. 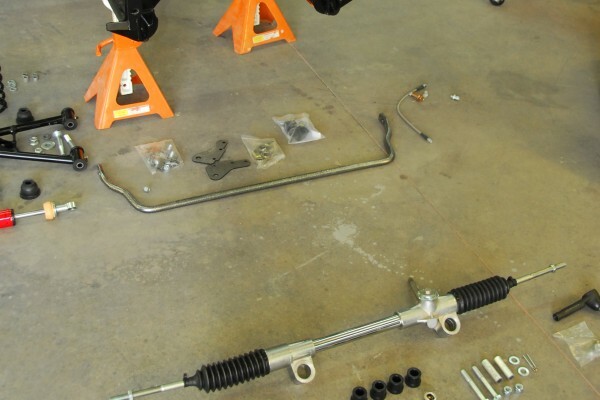 In Part 2, we’ll show how to install the 3-link rearend.